It has been a big news week for immigration. And today the ONS has published its latest migration figures, which shows that net migration to the UK has risen slightly year on year. 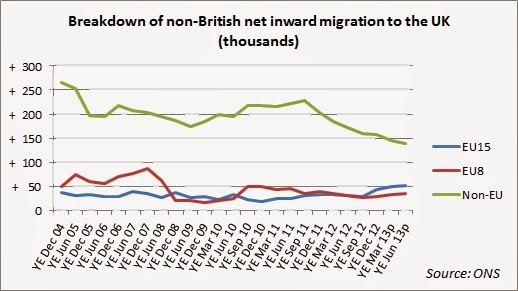 The focus is understandably on the latest net migration figure, because it is David Cameron's policy to get this figure into the tens rather than hundreds of thousands by the time of the next election (you can present the numbers in different ways, but the net figure is the one that the Government has targeted). Since 2010 there has been a marked decline in non-EU net immigration. As a proportion of non-British immigration to the UK, it has dropped from 73% in June 2010 to 57% in June 2013. In the last year alone, it has fallen from 172,000 to 140,000. Meanwhile, this year, net migration from the EU has gone up by 72,000 to 106,000. But, as the chart above shows, the recent increase in net EU migration has come from the older, more established (and traditionally more wealthy) EU member states (the EU15), not the new member states from central and eastern Europe that joined in 2004 (the EU8). One can speculate about the cause of this, but it would seem that the crisis in the peripheral eurozone countries has made the UK a popular destination for migrants from countries such as Spain, Italy, Portugal and Greece. What's the best place to publish an ECB letter setting out your country's economic policies? 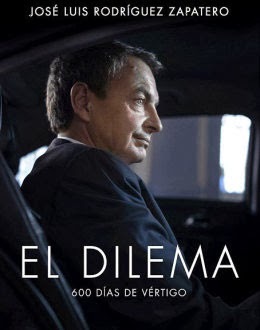 Former Spanish Socialist Prime Minister José Luis Rodríguez Zapatero has upset quite a few people after he included the letter he received from the ECB and the Bank of Spain in August 2011 in his recently published memoirs. Though bits and pieces of the letter had already been disclosed, the full content was never really made public. In a radio interview today, Zapatero has justified his decision to keep the content of the message secret at the time because at least part of it "would have put stability at risk". Therefore, as in the case of Italy (see our blog post from September 2011), the letter was a lot more than just a push to shape up. It was a detailed and quite prescriptive to-do list in return for ECB bond-buying - even boiling down to specific policy measures and the size of fiscal cuts. Furthermore, it did not shy away from touching on politically sensitive issues for Spain – just think of the demand for more central control over regional spending or the abolition of wage indexation. All this put the ECB squarely in the realm of domestic fiscal policy, somewhere many would agree it should not be. In any case, any country considering applying for an OMT bond-buying programme should consider these points when wondering how prescriptive the conditionality might be. Therefore, it is no surprise that many of the letter’s ‘suggestions’ have become government policy – though under the centre-right cabinet led by Mariano Rajoy, who took office at the end of 2011. 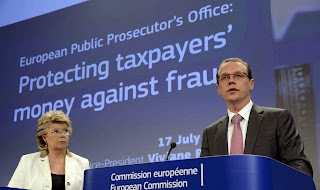 While all eyes are on EU free movement and EU migrant's rights to welfare access, the Commission has put out its response to the 'yellow card' shown by national parliaments with respect to its proposal for a European Public Prosecutor's Office (EPPO) - a body which would "investigate and prosecute EU-fraud and other crimes affecting the Union's financial interests". To re-cap, national parliaments in eleven member states - the UK, Czech Republic, Cyprus, France, Hungary, Ireland, Malta, Netherlands, Sweden, Romania and Slovenia - complained that the plans breached the subsidiarity principle - i.e. the principle that the EU should not act where member states are just as able to act on their own. This is only the second occasion on which the yellow card has been deployed. The weakness in the current system is that a yellow card only compels the Commission to consider whether to "maintain, amend or withdraw the proposal", meaning that if the Commission is determined to push ahead regardless, it can do so. This is is exactly what has happened in this case, with the Commission concluding that the "proposal complies with the principle of subsidiarity... and that a withdrawal or an amendment of that proposal is not required." "the drafters of the Treaty have expressly provided for the possibility of establishing the European Public Prosecutor's Office in Article 86 TFEU... This provision gives a strong indication that the establishment of the European Public Prosecutor’s Office cannot be considered per se and in the abstract to be in breach of the principle of subsidiarity." "In analysing the reasoned opinions, the Commission has distinguished between arguments relating to the principle of subsidiarity, or that could be interpreted as subsidiarity concerns, and other arguments relating to the principle of proportionality, to policy choices unrelated to subsidiarity, or to other policy or legal issues." Although the Treaty states the decision has to be reached by unanimity (so no danger of the UK being vetoed), this episode highlights the need to turn the 'yellow card' into an outright 'red card' - i.e. a definite veto. This could apply to existing as well as proposed EU legislation. In addition, national parliaments should be given more than the existing 8 week period to respond. The scope for national parliaments to object to EU proposals should also be widened from the narrowly defined principle of subsidiarity to prevent the Commission from being able to undermine their validity. As we've argued, in order for national parliaments to have a real impact in the EU they need real powers - otherwise this widely shared objective will not come to much. 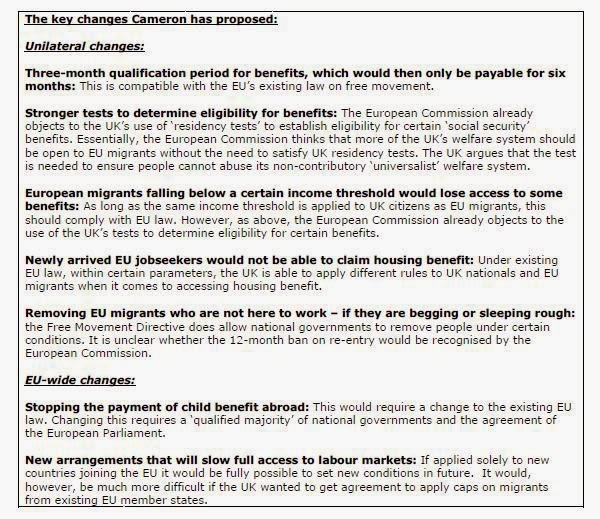 Will the European Commission challenge Cameron's crack-down on EU migrants’ access to benefits? 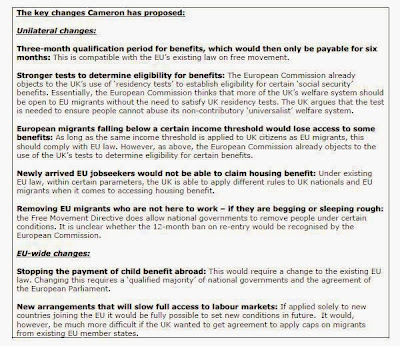 We have just published a new flash analysis looking at David Cameron's plans to change the rules on EU migrants' access to benefits. So whether the European Commission will take the UK to court will very much depend on, how, exactly the measures are implemented. Interestingly, so far the Commission has stayed clear of openly saying the measures are illegal, and of course, the UK government will have sought to ground this with both its own lawyers and EU ones. As we have said before (see here, here and here, for instance), we think the Commission has a tendency to be overly activist in this area. However, the key issues here - which Cameron could have done a better job of expressing in his intervention - is that the EU's complicated and outdated rules on access to welfare need a complete overhaul, something which the Austrians, Dutch and Germans have already signalled their support for. A Schengen opt-out: The SNP says it would "plan to continue in the current Common Travel Area" with the rest of the UK. 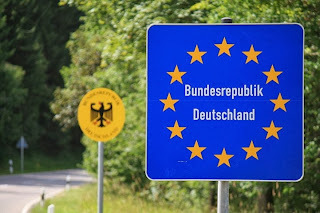 As signing up to the Schengen travel area is incompatible with the UK/Ireland CTA and Schengen is a part of the EU treaties this will need a negotiation. A Scottish EU Budget rebate: The UK is a net contributor to the EU budget, but would contribute even more if it had not secured a UK rebate. The SNP recognise that "Scotland is likely to be a net financial contributor to the EU" but state they wish to have their own rebate saying they "consider that the division of the share of the UK rebate would be a matter for negotiation". This would obviously be a difficult negotiation as it was for Mrs Thatcher at Fontainebleau. A Euro opt-out: The SNP state that it is "our intention to retain Sterling as the currency of an independent Scotland". As well as discussions with the rest of the UK, Scotland will ideally need to gain a permanent opt-out from the Euro. The UK and Denmark are the only two states to have such a permanent opt-out but the SNP argue that the case of Sweden (which is meant to join but shows no signs of joining) shows that the EU can be flexible. A Justice and Home Affairs opt-in: The UK has a special deal whereby it can chose to opt in to new JHA (justice and home affairs) measures on a case-by-case basis. The SNP have said that they "will seek to retain the current flexibility to opt into new measures on Justice and Home Affairs" meaning they will ask for their own ability to opt in. So in an independent Scotland's EU accession negotiations, the SNP will be asking for a number of special conditions already afforded to the UK. Firstly they would like their application to be considered while they remain a part of the UK, something they will also need UK approval for. They will then be asking for opt-outs from Schengen, the Euro, a JHA opt-in and perhaps most controversially a Scottish rebate. It is often thought that Scotland is less 'eurosceptic' than the rest of the UK. But is this true? One YouGov poll for instance suggests that 31% of Scots would vote to leave the EU against the UK average of 34% and that 55% would vote to stay in if David Cameron renegotiated and recommended a new deal the same as the UK average. Perhaps the SNP feel that if they were left inside the EU without a 'Scottish' rebate and their own version of the UK's existing opt-outs they might see a challenge from a tartan version of UKIP? 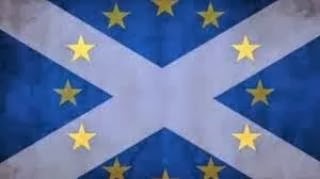 So at a time when disillusion with the EU is growing in the UK, the SNP is, like the UK parties, keen to demonstrate they will not be ceding more (Scottish) power or money to the EU. They even accept that there are, as in the UK at large, some Scots "arguing for a looser form of partnership" with the EU. Open Europe offers you a date with the future: what can the UK achieve in talks over its EU membership terms? Have you ever wanted to be a fly on the wall when EU leaders negotiate the EU's future? Well, Open Europe is offering you a front row seat at a simulation of what will arguably be the biggest negotiation round of them all: Will the UK will stay in the EU or negotiate a new relationship from the outside? If you are interested in the UK's future in Europe (and let's face it you must be if you're reading this blog), then this is an event you cannot afford to miss. Such simulations are commonly referred to as 'war-games', and our event will take place in our specially customised 'war room' in Westminster on 11 December, featuring leading European politicians and experts - many of whom are themselves involved in EU talks. This is a completely new and innovative experiment intended to bring some substance to what tends to be a highly theoretical debate (which tends to vacillate between two extreme positions), and, we must admit, we're very excited. "Will EU partners grant Cameron any meaningful concessions?" "Will there be an EU treaty change?" "What areas can Cameron devolve back to member states?" "What can he do on issues like free movement of workers or the UK's budget contribution?" "Would the UK not get a better deal outside the EU anyway?" All of these issues will be tackled in the course of our game. 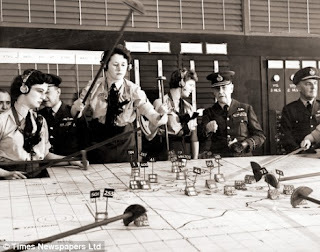 War games are commonly used by a wide range of actors including investment banks, governments and intelligence bodies in order to simulate developments in areas such as diplomacy, politics and business, with players responding to unfolding events in real time. The outcomes often prove highly influential on actual policy decisions. For example, it is said that the German government war-gamed Greece's exit from the euro - and decided not to pull the trigger. The majority of the time, these are conducted behind closed doors. Not so in this instance. We'll also have players representing Germany, Poland and the Visegrad group and the Netherlands and Belgium. What makes our game really exciting is that it will cover two distinct scenarios; in the first, other EU member states have agreed to engage with the efforts to renegotiate Britain’s place in the EU, while in the second, ‘no’ is the starting point, triggering discussions over ‘Brexit’. That way it will be possible to compare the deal the UK would get staying inside a reformed EU and outside it. For more information or to book a ticket, please visit our website or contact the Open Europe office. Eurozone reform contracts take shape - and they include "fiscal transfers"
As we have predicted numerous times - as recently as in our previous blog post - ‘reform contracts’ in the eurozone could well become the next thing. As a recap, these are agreements where one country commits to a series of structural reforms in exchange for low cost loans, or other form of help, to aid its economy. As we argued back in September - when it was unclear whether the idea would make a comeback - it's one of the politically more feasible options for Germany as it involves more control and less cash. Well, Reuters have now got their hands on the latest draft of the plans for these contracts and have published them in full here. The idea now seems to be firmly on the agenda, which is not the same to say it'll actually happen. 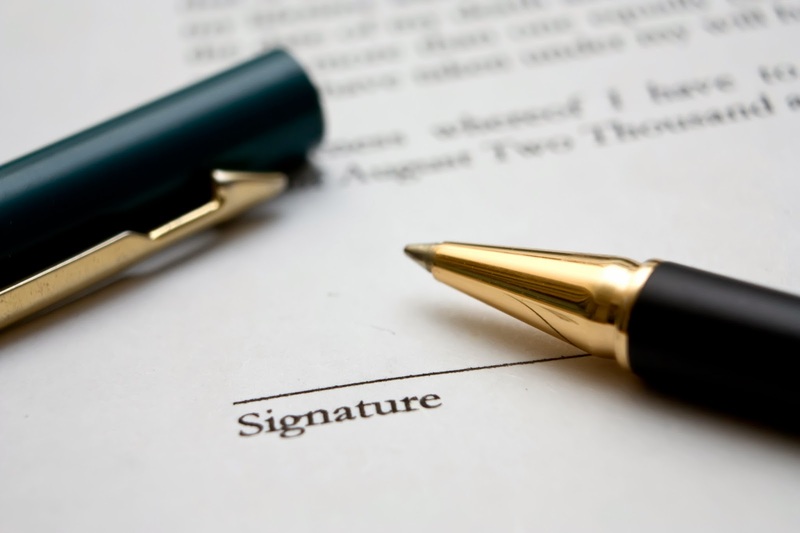 The contracts are seen as a supplementary part of the ‘European Semester’ – the new system of economic governance. They will build on tools such as the macroeconomic surveillance and budgetary oversight, which we have already covered in detail. The contracts are targeted at those countries not making adjustments under the other procedures. They are designed to promote “ownership” of reform and “home grown” policies (which lines up with Merkel's comments from yesterday). There is, of course, a tension here, given that by definition they are part of a system of increasing economic oversight and some would say a loss of control of economic policy. As Eurogroup Chief Jeroen Dijsselbloem suggested yesterday, if these countries aren’t pushing these reforms, slightly cheaper loans are unlikely to be the deciding factors in pushing them to do so. Further to the above point, the text does stress that the policies will be drawn up by the domestic authorities and will be renegotiable (unlike the bailouts or other parts of the governance system which are more set in stone).That said, they will come with significant “monitoring” – which, to us, evokes the feeling of the EU/IMF/ECB Troika trips to bailout countries. The loans will involve “limited fiscal transfers across countries”, the large majority of which would come through the lower interest rate on loans compared to the borrowing countries usual market rate. The open admittance of fiscal transfers has slipped into the draft, this sort of open admission is rare in the eurozone crisis, but given that the contracts are an explicit trade off, it is not entirely surprising (again, as we've argued). “The specific amount of financing would not be linked to the direct cost of reforms”. Instead it will be used more generally as an incentive to reform and aid any parts of the economy that need it or to help relieve funding pressure generally. This makes some sense since simply ‘paying’ for reforms seems rather circular and dictatorial. However, making sure the level of reform demanded matches up to the loan size will be very tricky. So this is something that could fly with the Germans, politically, but how much difference will that make in practice? 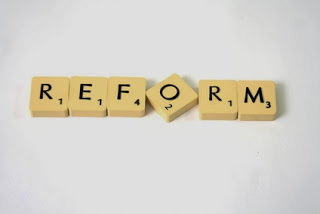 There are already numerous platforms for reform – bailout programmes, precautionary credit lines, macroeconomic surveillance and budgetary oversight (as well as good old political pressure). In the end it all comes down to the money. How much will be available and at what price? These questions are yet to be answered, but as with much in the crisis, the likelihood of a muddy compromise looms large. German coalition talks are dragging on, but we may have got a hint as to what a grand bargain between the eurozone north and south might look like, with German Chancellor Angela Merkel again appearing to open up for an EU Treaty change. "Germany is ready to develop the treaties still further. At the very least we have to be ready to improve the euro protocol of the Lisbon Treaty – which only applies to euro states – to allow an institutional co-operation via the so-called community method and not to only be active at intergovernmental level." She proposed a "new co-operation" between the European Commission and member states, with the policy recommendations being the result of negotiations. "In this way we create a sense of ownership, a sense of responsibility is created among member states to implement necessary change. That's what I understand by economic co-ordination." As we've argued before, it's easy to get sustained whiplash injuries from tracking the German position on EU treaty change, but this (again) sounds like 'reform contracts' or 'competitiveness pacts' to us - which we have long argued would come back on the agenda - with the European Commission acting as the 'structural reform police'. "If a country is not persuaded that it’s in its own interest to reform and modernise, it cannot be motivated from outside. It doesn’t seem wise to me to propose a ‘reward’ in return for a reform. Instead, I think one should link the concession of additional time to correct budget deficits to stricter conditions in terms of reform. I give you more time if you speed [reforms] up. 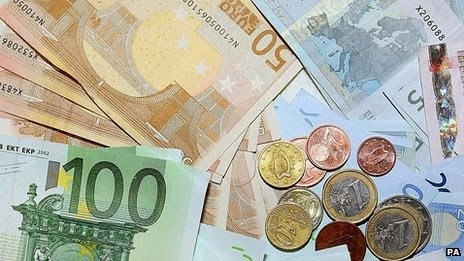 The European Commission may, if a country fails to do so, demand more on budget [adjustment]." As with many things in the eurozone crisis, we have now come full circle in the discussion of one part of ECB policy – the prospect of Quantitative Easing (QE). The debate over ECB QE was had when the crisis was at its peak. The motivating factor then was ensuring the euro stayed together. Now the motivating factor is low inflation/fear of deflation and low growth. The ultimate conclusion back then was that QE is not the right policy for the ECB (compared to the Fed or the BoE) for a number of practical and political reasons. Despite the current motivation behind the debate being different, we think the key constraints still hold, while other issues over the effectiveness of QE have also come into play. Our previous thoughts are here. Below we restate our points and add some new insights. Hard to target QE on the necessary sovereign debt: As we stressed in our previous post and note on this, any QE in terms of direct primary market purchases of eurozone sovereign debt would have to be shared out according to each countries share of ECB capital – i.e. 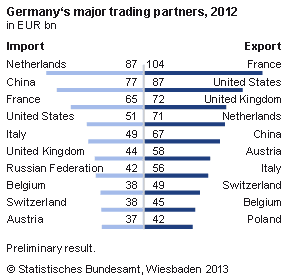 Germany and France would see the large majority of purchases. This significantly limits any real benefit in the periphery and could worsen the crunch for safe assets in the eurozone with the price of core eurozone sovereign debt being driven even higher (and the returns going further down). The hope would be that this would spur investment in the periphery countries but given the investment patterns in Europe and the upcoming stress tests, it’s clear that demand for periphery debt remains separate from demand for core debt. 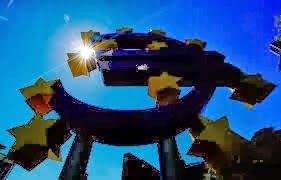 QE is very different to OMT: The exact constraints for OMT remain ill defined, but what we do know is that any purchases will be limited to short term (below 3 year maturity) debt on the secondary market, will be subject to the strict constraints of a bailout programme and the purchases will be sterilised. What form a QE programme would take is also unclear, however, it is likely to involve significant and widespread purchases which come with no conditions and are not sterilised. QE on private assets might have little impact in Europe: Unlike the US and even the UK, the European market for securities is far less developed. 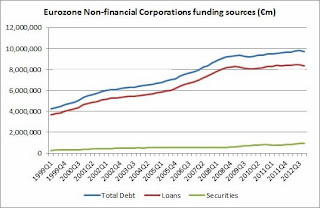 Furthermore, the corporate sector relies much more heavily on bank loans for funding than on debt issuance (see graph to the right). 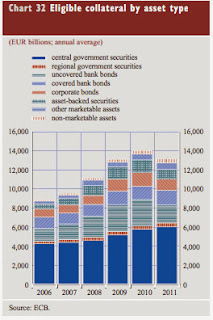 If the ECB decided on a QE programme to target different securities, the impact on the real economy would be limited by the structure of these markets. 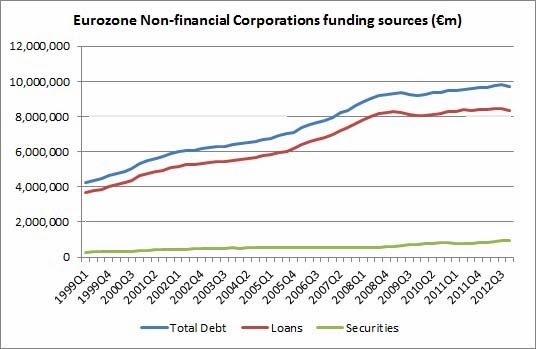 This point is driven home by the graph to the right below, which highlights the broad breakdown of assets in the eurozone - significantly dominated by government debt. The ECB could purchase mortgage backed securities, which is one of the more developed markets. However, a significant chunk remain non-performing (or close) and are opaque in terms of what is included inside them and what their true market price is. In all likelihood any purchasing of private sector assets would mostly be a boost to bank balance sheets, however, unless it is sufficient to completely reverse their deleveraging and kick start lending it would probably do more than push up asset prices. Political obstacles are significant: The programme would need approval in the ECB’s Governing Council. With a quarter already known to be against last month’s rate cut, opposition to such a significant step could grow. Even if it got through the fallout in terms of divisions within the ECB and the political blowback from within Germany could create serious problems for the eurozone. Bundesbank President Jens Weidmann even said earlier today that the ECB should not take further easing steps in the near future after the rate cut. The overall impact on the real economy is far from clear: the discussion over this point in the US and UK has been substantial, with no clear winner. While QE did likely help to avert a deeper crisis, particularly in the short term, the fact is that there is no clear link between higher inflation or higher growth and asset purchases of the central banks. For these reasons, we believe QE will be a very last resort for the ECB. It is practically and politically difficult. That said, it still seems like further easing is very much being considered. See for example the Bloomberg story today about the very real possibility of a negative deposit rate (which has weakened the euro significantly). 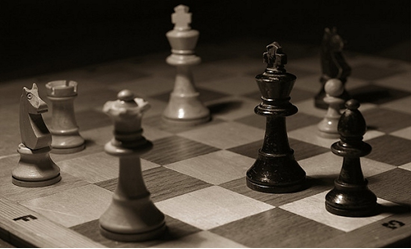 Such a move would itself of course come with drawbacks and difficulties, but we’ll leave them for another post. The Times’ Juliet Samuel has an interesting story today looking at the progress on bank bail-in rules and resolution funds at the EU level (via some leaked docs relating to the EU's Bank Recovery and Resolution Directive). Despite another round of meetings little progress seems to have been made in finalising the format of the resolution authority or the fund it would use to aid banks, i.e. the creation of the second pillar of the banking union – although there does seem to be a move to increasing the direct involvement of national authorities. Germany also looks to have conceded somewhat on using the ESM, the eurozone bailout fund, to aid banks as agreed over the summer. But given that this will still require a change in German law and approval in the Bundestag to activate it, the hurdles remain very high. See here for a recap of the country differences on bail-in plans, here for a recap of our take on the plans as they stand and here for our view of the banking union so far. 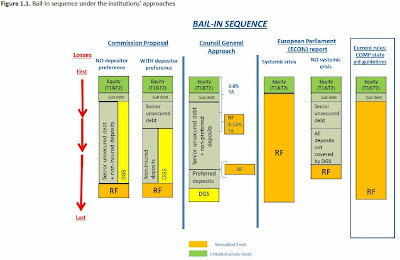 With this in mind the internal Commission assessment (which can be found in full here) raises some interesting points (it's worth keeping in mind the the bail-in plans and banking union are separate but very closely related when it comes to questions of aiding banks). 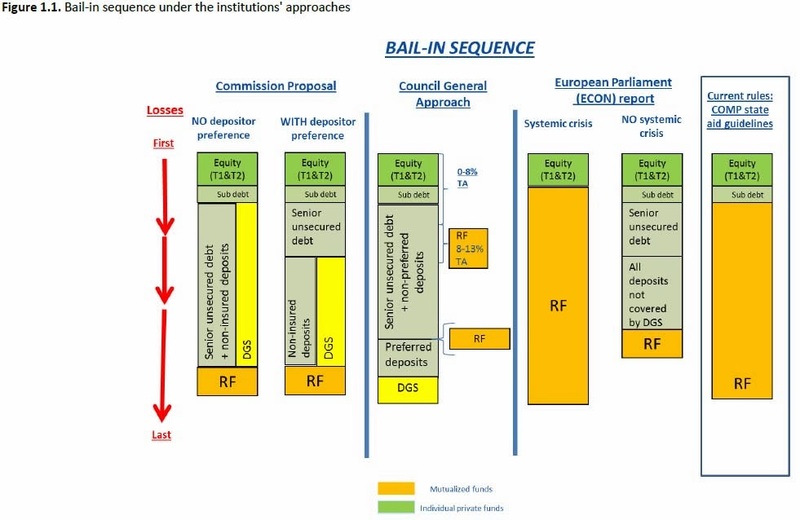 The paper essentially provides a comparison of the different bail-in approaches favoured by the European Commission (EC), the Council and the European Parliament (EP). The EC proposal sees a very strict bail-in structure with all levels of investors and uninsured depositors facing losses before resolution funds are tapped. The Council waters this down slightly, with some use of resolution funds at different stages. The EP goes further with greater protection of depositors and therefore more use of resolution funds (see graph below for a useful graphic on all this). Greater flexibility, leads to greater use of funds: The key point seems to be that any flexibility introduced into the bail-in system will significantly increase the level of resolution funds needed. Broadly, under the Council proposal this could reach €70bn under a 25% loss scenario. Under the EP structure the figure could top €200bn if there was a systemic crisis. These are rough figures gleaned from the numerous scenarios, but the message is a clear warning to the Council and Parliament about allowing too much flexibility from the planned bail-in rules. Where would these funds come from? This is the obvious follow up. No plan is presented in the paper and the general idea is that they would be built up over time from taxes on the financial sector. But under the current plans this could take up to 10 years, from a start in 2018. What happens in between? There seems little choice but to infer that national taxpayer funds would be tapped if another crisis hit. Bank investors and even depositors lined up to take big hits under bail-in: Another key feature of this paper is that, for the first time, it highlights the type of losses investors and depositors will face if a crisis hit under the bail-in rules. In nearly all scenarios, albeit to varying degrees, even senior debtors and uninsured depositors take large hits. As these discussions develop and the final structure becomes clearer the market will begin to reassess the pricing of different instruments – whether deposits, debt or other instruments are favoured could well affect bank funding structures. Beyond these points there is little more significant to draw from the paper. It debatably raises as many questions as it answers – what will the final format be? When will it be introduced? How will any resolution funds be funded? Will this be done at the EU or eurozone level? The motivation behind the paper is also worth considering. It’s clear the Commission is trying to send a bit of a message here, warning the Council and EP against watering down the bail-in plans too much – at least if they don’t want to put up significant resolution funds. Whether or not this will be taken to heart remains to be seen. In the 1990s, the process of eliminating trade barriers between Europe’s member states was hijacked by an ideologically driven elite bent on nation-building; on giving flesh to the postwar dream of ending conflict by abolishing Europe’s patchwork quilt of selfish national states. In constructing this project, the ends always justified the means, even if this meant ignoring the electorate. Those in this country who opposed the UK joining what was to be the crowning glory of European integration, the single currency, were vilified as Little Englanders. Now the game is up. Elected parliaments have become the sole accepted seal of legitimacy. 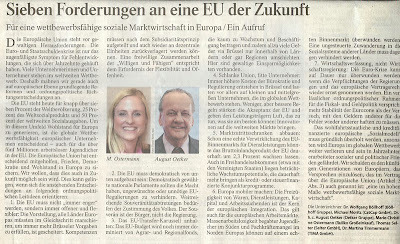 A new generation is saying that the EU is in desperate need of both democratic and economic reform. The Dutch government has called time on “ever closer union”, the German chancellor Angela Merkel says we should “consider whether we can give something back” to member states, and the Italian prime minister Enrico Letta talks of treaty changes in the “very near future”. Britain needs to be attuned to the changing mood. Its current shouting match between polarised camps doesn’t help. I have lost count of the number of times I’ve been asked by the BBC to take part in or stage a debate between “europhile” and “eurosceptic” business leaders. Spurious facts and figures are thrown around — “3m jobs will be lost if we leave the EU” or, “if we withdrew, the UK would instantly be freed from all EU regulatory costs”. The reality is that business tends to be neither die-hard europhiles nor convinced “outers” — with exceptions, most are in between. Business values access to European markets but doesn’t see why it has to come with a political union. On balance, business still likes the EU’s combined weight in trade talks but worries about protectionist tendencies and the dampening effect of Brussels regulation on firms competing in global markets. As the economic climate hardens, more business people on the Continent make the same analysis, concluding that we have to lay grand ideological projects to rest and focus on where the EU can add value. The objective is therefore simple. The EU’s defining purpose must be the single market — it doesn’t have to be the only thing the EU does, but it is the primary mission. The task at hand is equally simple: maximise trade — including in the hugely underdeveloped EU services market — and minimise non-trade costs. Once we have tested the limits of reform, we can see if it still makes sense to remain an EU member. So it’s time for business to make its voice heard. It won’t be easy to achieve the reforms we need if we are to reverse Europe’s economic decline and win back the support of our electorates. If Europe’s wealth and job creators throw their weight behind this agenda, not even the most detached politician or eurocrat will be able to resist. As expected, the European Commission today announced a review into Germany’s current account surplus under its Macroeconomic Imbalance Procedure (MIP). This has been a topic of hot debate recently and has the potential to become a very important debate in the future of the euro and Germany's role in it. We laid out our thoughts on the issue in a detailed post last week. 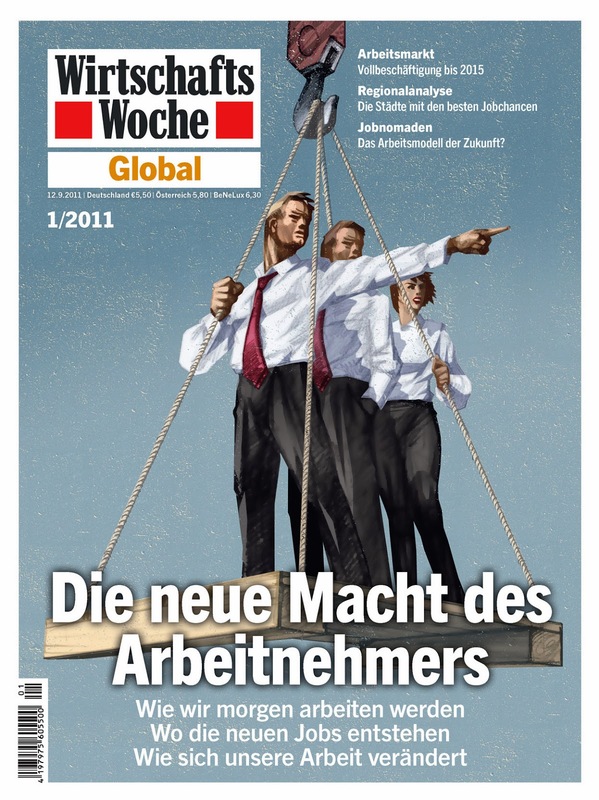 We recommend re-reading it, but the thrust is that, while rebalancing is needed, boosting imports in Germany or cutting exports would do little to help the peripheral economies because they simply do not produce goods and services which Germany want and do not produce the same exports to replace Germany’s if it lost competitiveness. That said, by the letter of the law the Commission was right to launch the procedure given that Germany has broken its threshold on the current account surplus (over 6% of GDP since 2007, see graph below). The key point is for the Commission to judge it on its merits not as a political process – to be fair the Commission itself stressed this point but there have been hints that it takes a bit of a dim view of the large surplus. 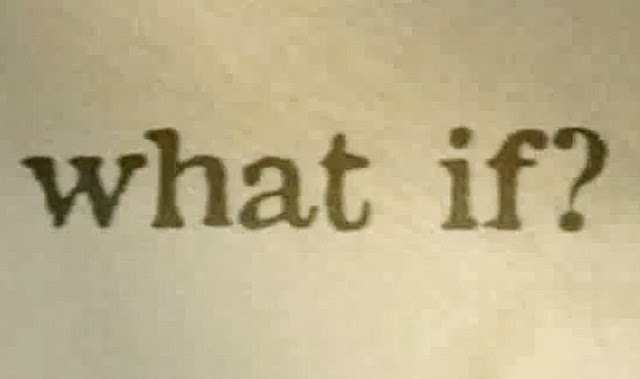 What happens now? It’s early days yet. The Commission will begin its review and complete it by spring next year. The recommendations will then be included in next year’s European Semester and country specific economic recommendations. 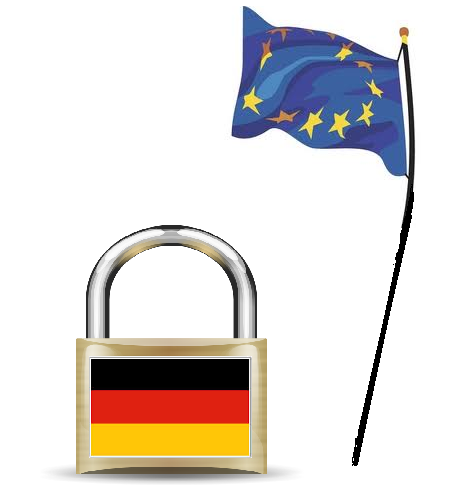 The key will be how hard the Commission goes on the arguments and how Germany responds. If it fails to implement the reforms the Commission does have the option of imposing a fine or even sanctions on Germany. Signs on this front so far show the potential for conflict. German reactions have already been quite hostile with CSU General Secretary Alexander Dobrindt warning that, “You don't strengthen Europe by weakening Germany” and CDU General Secretary Hermann Gröhe adding, “Our export strength is the corner stone of our prosperity”. Bundesbank President Jens Weidmann added that expanding Germany fiscal policy is also not the answer, saying, “The positive knock-on effects would be limited”. Emphasis on euro strength: Numerous times the report argues that Germany’s long standing surplus is helping push up the euro exchange rate, making the periphery’s adjustment harder. This seems a strange point to focus on given that it’s not Germany’s job to manage the exchange rate. There are also plenty of other factors which influence the euro, including but not limited to: actions of other central banks (notably the Fed weakening the dollar) and the repatriation of funds to Europe as banks and business refocus on core European operations. The report also says that Germany’s real effective exchange rate (REER) has come down due to a weaker euro, which seems a tad contradictory. Causality between deficits and surpluses: The Commission highlights that defining a clear link between one country’s deficit and another’s surplus is not as simple as first seems. This is a point we made in our previous blog. While Germany may have previously been the flip side of other countries deficits, these deficits have now closed and Germany has maintained a surplus by trading with non-euro countries. 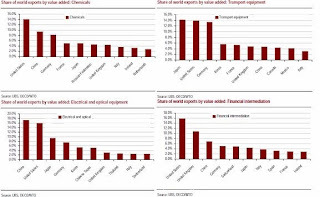 The Commission also notes that countries such as Germany can play a key role in the supply chain – this means its exports create demand of imports of inputs from other countries, it also highlights that Germany is not always the source of the final demand for imports. The German government itself flagged this up, saying that “40%” of its exports rely on intermediate goods imported from EU partners. Germany did play a role in previous peripheral deficits: As mentioned above Germany did play a role in sustaining the large deficits in the peripheral countries which helped cause the crisis. However, as touched upon in the report, this is more a failure of supervision (both financial and macroeconomic) and a failure on the part of the periphery to invest the money into factors which would promote long term economic growth. After all these investments were helping to drive significant growth at the time and these countries did reap some benefits, but failed to make them lasting. This dynamic was also almost inevitable as a result of pushing such different economies into a single interest and exchange rate policy. Germany has troubling demographics: Countries such as Germany, with an ageing population, are always going to be inclined to save more. Judging what level of saving is warranted or needed given such constraints is tough, but it’s clear that German businesses and people have already made up their mind to save more. Germany does need to unblock obstacles to domestic demand: The report is correct to highlight that Germany can do more to promote demand, notably by liberalising its services sector and reducing the level of taxation. Germany above the threshold for public debt: the Commission will review this imbalance as well, highlighting constraints to any demands for further public spending. All in all, the Commission does try to cover both sides of the argument but the tone still seems to lean towards asking Germany to do more to boost demand. If this is through liberalising measures it will be welcome (at least by us), however, if it calls further jumps in spending and wages it could find a very hostile reception in Germany. In any case, the scene is set for what could become a crucial debate over the structure of the euro. The crux of the argument comes down to – what is Germany expected to do to save/aid the euro and what is it willing and able to do (politically, legally and economically)? Leading German journalist and author Bettina Röhl has written a long op-ed for Germany's leading financial magazine Wirtschafts Woche, welcoming the new Open Europe initiative that sees businesspeople across Sweden, Britain and Germany unite for the first time to call for bold EU reform. "Anyone who wants to rob Europe of its diversity and drown it in Brussels fatuity, and all of this under the roof of a single currency, has failed splendidly in their rigidity. By throwing their gaze inwards rather than towards to world markets, they either do not care about European competitiveness, or, they have not understood the global economy." So, we've mostly had positive responses across the board to our joint-initiative - with the odd exception. 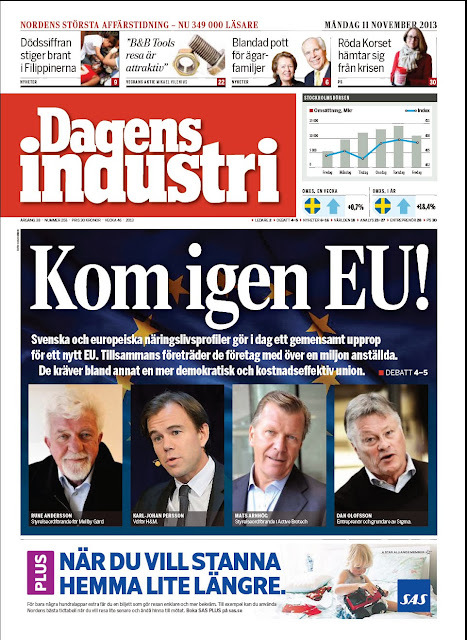 A leader in the Swedish regional paper Göteborgs-Posten, for example, thinks it has cleverly spotted two “contradictions” in the article signed by some of Sweden's top business people in Dagens Industri. Firstly, the leader argues that it is inconsistent to call (as we do), for less EU regulation and more services liberalisation – because the latter would require “common rules.” That argument doesn't cut the mustard, we're afraid. As we’ve pointed out many times before, it's of course fully possible to be in favour of “more Europe” in areas like services liberalisation, and less EU regulation in other fields where it makes less sense for Brussels to be involved. Or is the paper really suggesting that the EU regulatory framework is pareto optimal at the moment and that there's no room for a reform package whose net effect is less but better EU regulation? To bring it closer to home, it's fully consistent to support an ambitious services directive while opposing, say, heavy-handed EU regulation on snus (a variant of dry sniff which is close to religion in Sweden - but a sales ban exists in the rest of the EU). Also, in theory, under our preferred option – mutual recognition or a “passport” – you wouldn’t actually need more EU harmonisation, but let’s not split hairs. (Suggested reading: Open Europe: Services report, Open Europe blog: Services liberalisation ). Secondly, the Göteborgs-Posten's leader claims that to in order to "give citizens a stronger say over EU, more EU decisions needs to be made by directly election institutions – like the EU Parliament. Which in turn means more supra-nationalism [or federalism]”. Yes, that’s the purist, federalist version of how to close the EU's democratic deficit - transfer ultimate democratic accountability to the EP. However, where the leader finds its “contradiction” in the business article is hard to see. This federalist theory is a perfectly respectable one but it reached its prime about a decade ago. To some, the EP might still be part of the answer, but the debate has now self-evidently moved on to other ways in which to strengthen democratic legitimacy, including boosting the roles of national parliaments (where the Dutch – not the British – are leading the way). Göteborgs-Posten is about ten years late to this debate. Bottom line: In order for the EU to truly compete in the global economy, it needs to reform. It needs to be more flexible. It needs fewer rules with a sharper focus. It needs to give entrepreneurs the space to do what they do best: generate wealth and opportunity. With the right reforms, Europe totally has the potential to rise to the challenges of the 21st century. To find out more about our initiative to ensure that Europe makes the reforms it needs order to be able to compete in the 21st century, click here. Following a reported 16 hour marathon negotiation, representatives from member states, the European Commission and the European Parliament struck a deal on the 2014 annual budget in the early hours of this morning. As the sides failed to agree under the normal timetable, the so-called 'conciliation' process was invoked to tackle the remaining sticking point - the final billion euros either on or off the Commission's proposal. In the end the sides met roughly half-way - MEPs accepted a €400m cut and the member states agreed a €500m increase compared to their demands. As ever with the EU budget, politics and symbolism were just as important as the actual substance of how and where the money is spent. Having said that, there is some good news - the budget sees actual payments of €135.5bn and new spending commitments of €142.6bn - decreases of 6.5% and 6.2% respectively compared to 2013. This reduction is because the 2014 budget is the first to be agreed under the new overall spending limits (2014-2020) agreed by David Cameron and other EU leaders back in February - the first ever long term budget to be lower than its predecessor. The coalition will therefore be able to credibly claim it has achieved tangible reform in this area. The bad news, as we noted way back in June, is that in order to achieve these cuts, the UK was forced to swallow an additional €11.2bn in retroactive top ups (so called 'amending budgets') to EU spending in 2013. Without these tops ups, the EU budget would actually have seen a small real term increase from 2013 to 2104, albeit under the rate of inflation. The second tranche, coming in at €3.9bn, appears to have been formally signed off by ministers yesterday as well despite the UK's opposition. Furthermore, as we've said many times before, as well as the size, the substance of the budget remains hugely flawed with the bulk of the budget composed of growth destroying farm subsidies and regional development funds recycled between wealthier member states, and millions wasted on unnecessary quangos and institutions. So in summary a good start, but still plenty of scope for further reform. As we point out in today’s press summary, the German media is abuzz with reports that a proposal has been tabled in the on-going Grand Coalition talks between the CDU/CSU and SPD on encouraging more "direct democracy" via national referenda, including on the transfer of new powers to the EU. Details remain unclear, but this looks similar to the UK’s own “referendum lock,” which provides for automatic public votes in many (but not all) cases of powers being transferred from Westminster to Brussels. "the accession of new Member States, important competences being transferred to Brussels or Germany’s financial contributions at the EU level - for this, we want to provide nationwide referendums." 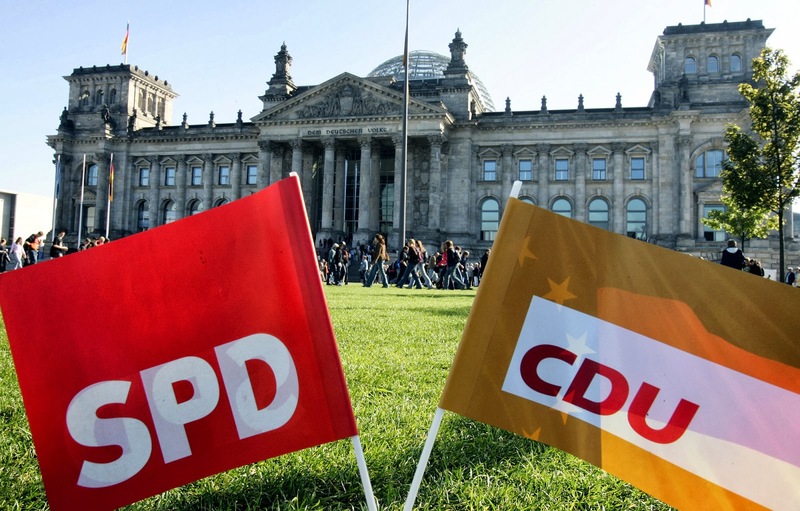 The CSU campaigned for the introduction of referenda on important European policy decisions during the election, while the SPD has, in principle, been in favour of direct democracy for some time. While the CDU is somewhat more sceptical, there is still support for this idea within the party's own ranks. Schäuble last year floated the idea of a referendum on a new constitution. More financial contributions which, presumably, would include any form of transfer union. If this becomes part of the Coalition agreement it would be hugely significant. Germany, a country historically allergic to referenda, will have one of the strictest regimes with respect to public EU-related votes in Europe. More to the point, as revealed by our own polling, it’s very hard to see how it would be possible to get, say, fiscal transfers voted through by the public (though even without the commitment, changing the German Constitution could require a referendum as per Schäuble's suggestion). Significant transfers of powers could also be blocked by public opposition. The big difference between this and the UK’s referendum lock is that the German one would also apply to future enlargements. That would be a de facto massive block on a future Turkish accession, for example. Still far from certain the idea will materialise in the end but it's definitely one to watch. As we've argued before, whenever anyone makes a claim about the cost or benefits of the EU, look out for the counterfactual - i.e what would be the case if the UK weren't an EU member. The classical "3 million jobs would be lost if the UK left the EU" claim is one of the most conspicuous examples of a rogue statistic without any credible counterfactual attached to it. Of course 3 million jobs wouldn't be lost over night if the UK left the EU, because all trade with Europe wouldn't suddenly disappear (even North Korea trades with the rest of the world). But, as we also have argued, Better Off Outers who believe a world of unilateral trade and pareto optimal regulation would ensue on the day after the UK left the EU are also making huge leaps of faith. On that note, UKIP’s Tim Congdon takes issue with something we said in a blog last week in his latest group email. When highlighting problems with the CBI’s recent cost-benefit analysis we were a bit loose in our critique of Congdon's study measuring regulatory costs, pointing out similarities with UKIP’s own analysis (right) in terms of the counterfactual. "Mastered the art of measuring EU costs with no reference to a counterfactual (see [Tim Congdon’s How much does the European Union cost Britain?] – for a fine example). To a large extent, the CBI study falls into the same trap." "The UK’s departure from the EU would allow us to adopt unilateral free trade, which economists tend to regard as the best policy." "In my study I estimated the costs of EU regulation and protectionism assuming that the EU would carry on pretty much as it had been doing for the last 20/30 years, and that the UK outside the EU would be lightly-regulated and pro-free trade." So, he does provide a counterfactual - apologies for saying otherwise. There is still a problem however: it's a completely unrealistic counterfactual. The UK would not turn into to Hong Kong on Day 2. However much one would like to see all the costs of the EU to evaporate and for the UK to adopt unilateral free trade, with corresponding unilateral liberalisation on the EU's part - covering everything from rules of origin for UK-exported cars to "passports" (if you can trade in one country you can trade in all) for UK-based fund managers. Do you really trust Whitehall and Westminster that much? Also, under article 50, the Mediterranean bloc could stop EU trade liberalisation for a very long time. Call us pessimistic but that’s life. Bringing the point back round to cost benefit studies in general, contrary to what Congdon suggests in his email, we believe determining the counterfactual for the UK outside the EU is actually pretty difficult (see our report 'Trading Places' for a full discussion of this), and providing a quantitative assessment of it is even harder. As the Channel 4 fact check blog highlights, this difficulty has lead to a very wide range of estimates on the costs and benefits of EU membership. In any case, our wider point still stands, that studies of this type are full of caveats which hamper their effectiveness, no matter how tempting putting a single number on the costs/benefits of EU membership sounds. When a group of business people who, amongst them, have helped to lead companies that employ around one million people, say something, it's a good idea to listen. 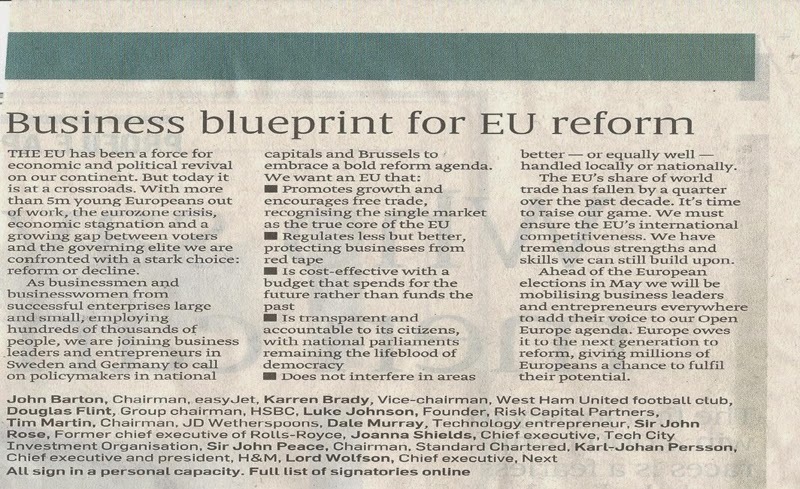 In an unprecedented joint initiative, leading business men and women from across Northern Europe used a letter to the Sunday Times and op-ed articles published in today's Frankfurter Allgemeine Zeitung and Dagens Industri to call on EU leaders to grasp the nettle and embrace reform. The list of signatories, who have all signed in a personal capacity, includes household names and is particularly significant because many have not spoken out on the issue of 'Europe' before. They include Karl-Johan Persson, the CEO of Swedish retail giant H&M, Dr. h.c. August Oetker, Chairman of renowned German food producer, Dr. Oetker, Douglas Flint CBE, Group Chairman of HSBC Holdings, Joanna Shields, Chief Executive of Tech City, and Sir John Peace, Chairman of Standard Chartered Bank. The business leaders and entrepreneurs who have signed up to this initiative come from businesses in different sectors of the economy and, uniquely, this initiative, coordinated by Open Europe, cuts across borders. This joint initiative shows that there is a market across much of Europe for an EU reform agenda centred on making the EU more business-friendly, internationally competitive and democratically accountable. However, the only way to do that is to make the arguments heard across Europe and put so much pressure on politicians that it cannot be ignored. 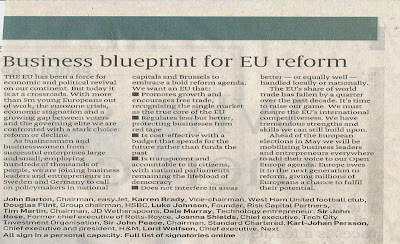 This is the first step in pushing a robust reform agenda ahead of the European elections next year and beyond, and we will be encouraging plenty more entrepreneurs across Europe to sign up to this initiative. So watch this space! This is the argument made in a very interesting op-ed penned by French MEP (and former Justice Minister) Rachida Dati, of the centre-right UMP party, for today's Le Figaro. We reported on the article in today's press summary, but we thought it was worth translating it (almost) in its entirety. Is a new wind blowing through Brussels? The old myth of [European] federalism may be falling...The elite cheers the self-proclaimed 'Europeans', who, to preserve their post, write pamphlets lamenting this technocratic Europe, rejected by the peoples and origin of all populist movements. Some others want to change things, acting against the tide of the 'Brussels elite'. These are the modern, the courageous, the defenders of a realist Europe. David Cameron is one of them. When he proposes to the British people a referendum on the UK's future in the EU, he acts responsibly. To deny [a referendum] to the British people, who are asking for it, would be the best means to exacerbate the anti-European sentiment that is on the rise not only across the Channel, but everywhere in Europe. When [David Cameron] proposes repatriating certain competences from Brussels to the national level, that's what we want too! We believe, like David Cameron, that the future of Europe depends on it. It's with this same spirit that we must move forward with useful deregulation. David Cameron has had the audacity to put this idea onto the European agenda. 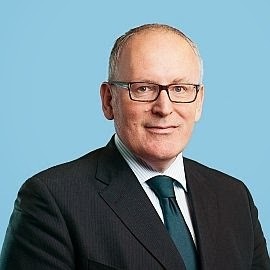 Even [European Commission President] Barroso, the 'pusillanimous', has been forced to launch the REFIT programme, aimed at simplifying and easing EU law. [French President] François Hollande is right to be cautious with the British offensive, which is good in the form, but whose exact outline we don't know yet. An ultra-liberal initiative would backfire against the people we say we are listening to. It is imperative to simplify [EU regulation] to boost the competitiveness of European businesses, especially SMEs. But this simplification must not be done to the detriment of certain rights of workers or the safeguard of citizens’ private life. However, this is a debate that deserves to be opened. I plead for this simplification to be applied to the domain of energy as a matter of priority...The most serious problem [with EU energy policy] is the multiplicity of contradictory environmental, energy, and climate targets. Taken individually, these targets are laudable. But the facts have proven that, combined, they could cancel each other out - not to speak of the damage done to the competitiveness of our businesses. This is the case with renewable energy. Due to the subsidies it benefits from, the market is distorted as its use is prioritised. By their own nature, these sources of energy are intermittent, and cannot cope with energy demand on their own...I intend to make the ambition for a European energy policy that is more flexible in its targets and, finally, consistent, one of the priorities of the UMP's campaign for [next year's] European elections. The UMP must finally stop hesitating about its European stance. We have never been listened to so much as when we knew how to talk and listen to the [French] people, particularly the popular classes. On Europe, they are asking us for a realist revolution. Let's listen to them! US and Germany trade blows over macro policy, but is Germany's export focus really to blame for the woes of the eurozone? 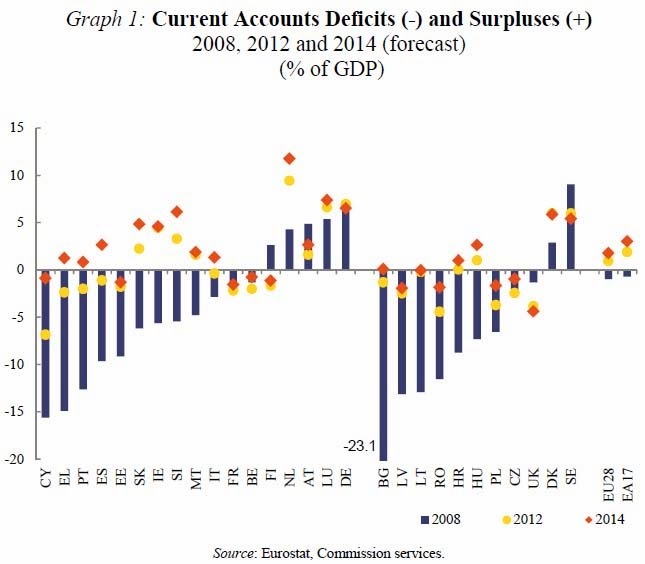 “Germany has maintained a large current account surplus throughout the euro area financial crisis...Germany’s anaemic pace of domestic demand growth and dependence on exports have hampered rebalancing at a time when many other euro-area countries have been under severe pressure to curb demand and compress imports in order to promote adjustment. The net result has been a deflationary bias for the euro area”. Germany (unsurprisingly) took offence to this and hit back that its surplus was simply a result of competitiveness and global demand for German products. Numerous commentators have weighed in to add to the criticism of Germany with Paul Krugman, Martin Wolf, the Atlantic and the Economist Free Exchange blog all lambasting Germany, albeit to varying to degrees. (See Bruegel here for a good round up). The WSJ's Richard Barley attempts to provide some much needed balance to the discussion. The thrust of the argument is: Germany should boost domestic demand to provide a demand boost for the struggling eurozone economies (via imports). It should also allow wages and prices to rise (reflate) to reduce its advantage over these other countries, allowing them to take over some of Germany's market share. So, who is in the right? We’ll leave that up to you to decide, but we do feel the debate has been rather one sided in its criticism of Germany. With that in mind, below are a few points to ponder. 1) Germany is not as big a source of demand for peripheral economies as assumed: As we have noted before, the assumption that if Germany imported more, the peripheral countries would benefit seems overstated. We have already pointed out that the eurozone and particularly the periphery make up a declining source of Germany’s trade. Importantly, Germany is also a limited source of demand for these countries. In 2012 exports to Germany from Greece, Italy, Portugal and Spain amounted to 0.9%, 3%, 2.9% and 2.25% of their GDPs respectively. 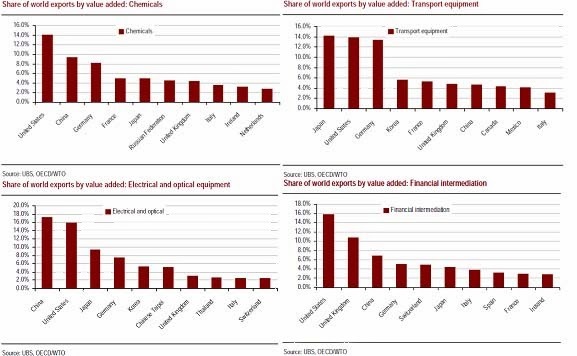 So, if Germany did boost its domestic demand and consumption only a small amount would filter through to imports from these countries and this would amount to a very small boost in GDP. To have any real impact then, Germany would consciously need to direct an increase in imports from these countries - not a realistic proposition. Also, keep in mind as well that it could do little to offset the massive collapse in domestic demand, investment and government spending which in many cases amount to double digit percentages of GDP. 2) ECB’s one-size-fits-all policy: As the Economist Free Exchange blog points out, the issue of reflating probably has as much to do with the ECB as it does with Germany. But as we have pointed out the ECB faces a tough time in tackling low growth and low inflation due to numerous technical, legal and political constraints. Furthermore, if Germany did start reflating quickly, with wages and prices going up, significant problems could be created for the ECB and its middle of the road, one-size-fits-all monetary policy. It would find it even harder to marry its single policy for a fast growing Germany and other countries. 3) Even if Germany became less competitive or exported less the periphery would not necessarily pick up the slack: Again as we noted before, Germany and the periphery have very different areas of expertise and specialisation – if Germany lost competitiveness due to reflating, the periphery may not fill the gap for cheap exports, particularly in manufactured and industrial goods. Chances are that emerging markets would reap the benefits or at least a large share of them. It's also worth noting that increasing wages may not be as simple a prospect as it sounds given that it cannot be done directly by the government and requires an agreement from both unions and businesses. 4) A less competitive eurozone: This is a point the German government has raised previously and it has some merit. Although a German reflation would aid the adjustment in other countries (as the adjustment needed to become competitive relative to Germany would be less) the competitiveness of the eurozone as a bloc would be relatively decreased since the average unit labour cost would be higher. This can be offset somewhat by a weakened currency, but given that the ECB takes no specific action to influence the euro, it is far from guaranteed. 5) Germany has had an excess of savings for a decade: While Paul Krugman is right to point out that Germany has not always run a current account surplus, it has done so for nearly the entire time the euro has existed. So why was the excessive saving in Germany not an issue previously? Obviously, global demand has fallen and domestic demand in many periphery countries has collapsed, but previously German savings were heavily invested in the southern economies (through the banking system). This no longer happens, in a large part due to concerns over the stability of the euro and these countries economies and governments. This highlights the need to address the structural flaws in the euro, improve the business climate in these economies and create a banking union. 6) You cannot have a currency with 17 Germanys: All the above said, you clearly cannot have a bloc of countries, which trades significantly with each other, all focused on creating an export model. Where would the demand come from? Clearly, Germany alone cannot provide it and being entirely reliant on external global demand is a risky strategy. An obvious point which seems to be missed is that, the current account deficits of these countries have decreased while Germany's surplus has not. If it was the flip side of these deficits then it would automatically fall. The relationship between the two has become detached as Germany and other countries have taken a more global outlook. A weaker euro which is often also targeted in this type of debate would probably aid Germany more than others given its export base. This is linked to the impact looser ECB monetary policy which would probably weaken the euro - as such it seems strange for certain politicians to push for such action. To be fair to the US, it is far from alone in raising this point - the IMF and Commission have both mentioned it. That said, a singular country, even one the size of the US, commenting on another’s economic policy is different to an international institution or private sector commentator doing so. Germany is also not alone in coming in for flak, as has been happening for some time, the US also hits out at China's excessively weak currency. Martin Wolf makes a wider point, that Germany is hampering global demand. This seems more valid since it is increasingly turning away from trade with its euro partners to elsewhere. We have pointed out many time that imbalances are a big problem in the eurozone. There is no doubt some rebalancing is needed. The Economist Free Exchange blog makes a good point, that this can be done through reforms such as tax cuts and opening up markets which would not impact competitiveness directly but would boost demand. There is also no doubt that Germany's and the eurozone's handling of the crisis has been less than stellar, as we ourselves have noted many times. That said, pushing much of the blame onto Germany's current account surplus seems a bit misguided. Some correction is needed but it alone is far from enough to have a sizeable impact in reversing the crisis. That is exactly why more concrete progress on the banking union, structural reforms and reducing the democratic deficit is needed in the eurozone.